It is clear from looking at Ludvig that she is a Gnome. She may be small in height, but in heart and spirit there are no bigger in all of Helan-Skaa. Ludvig is noble born, though Lord and Lady TitanCanon are her parents she was raised by her tutor Elgin. It was from Elgin that she learnt the history of Helan-Skaa, all the tales of knights and wizards, heroes and villains. Sitting for hours listening to these stories Ludvig became convinced that one day she would be a noble warlord, leading heroes into battle. Unfortunately this time she spent reading her books did lead to her having a lack of human contact as a youngster. With no siblings and distant parents Ludvig developed a personality that others find very difficult to deal with. Seeing the world in black and white, and she does not understand why anyone wouldn’t behave in a completely moral manner. She is also incredibly naive, and the simplest of conmen could convince her of anything. Yenwood Shortcloak is an enigma, wrapped in a mystery, wrapped in a beautiful velvet cloak and hidden in a mist of steam from a teapot. He’s most commonly seen travelling the land selling his wares; various teas and teapots from around Helan-Skaa and sometimes further. Yenwood is a quiet on his past, but it is clear from his ability as a sorcerer that he hasn’t always been a teapot salesman. He claims to want a quiet life, merely selling his wares and learning more about tea, but somehow he seems to always get himself into incredible and dangerous situations. Though Yenwood is essentially a good person he does have a naughty twist. He is more than happy to manipulate people for his own ends, and though he probably wouldn’t ever steal he is certainly willing to convince people to give him what he wants, even if they don’t want to. If he was to bump into a very naive Gnome, for example, he might decide that he could definitely take advantage of the situation. Igor is one tough son of Dwarf. He grew up in the High Green Mountains, a range of mountains which sound beautiful and lush, but are truly cruel and barbaric. 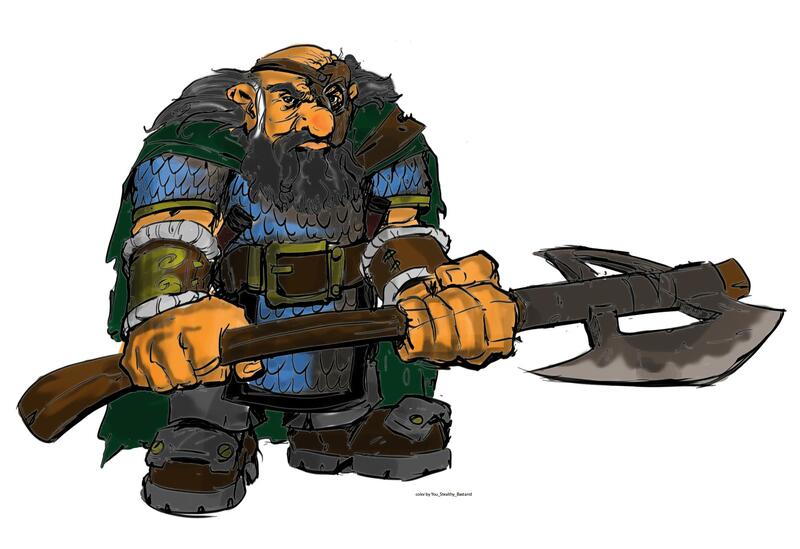 Igor grew up drinking fine ale, fighting his fellow dwarfs, and traipsing through the mountains battling anything that dared think it could kill him. Igor’s only real regret growing up in the mountains was his lack of a pet dog. He would see travellers going through the mountains with their huge pack dogs, pulling sleds or protecting their caravans, and he yearned for his own hound. He yearns for his own. Igor finds himself in Arne almost by accident, he remembers drinking out in a small village tavern with a Dragonborn named Trakkel, and his next memory is waking up in the woods without his coin purse. He did eventually find Trakkel, but more importantly he found some companions he could travel with in Ludvig and Yenwood.